The sun’s brightening rays are taking center stage, and Summer is definitely in the air! 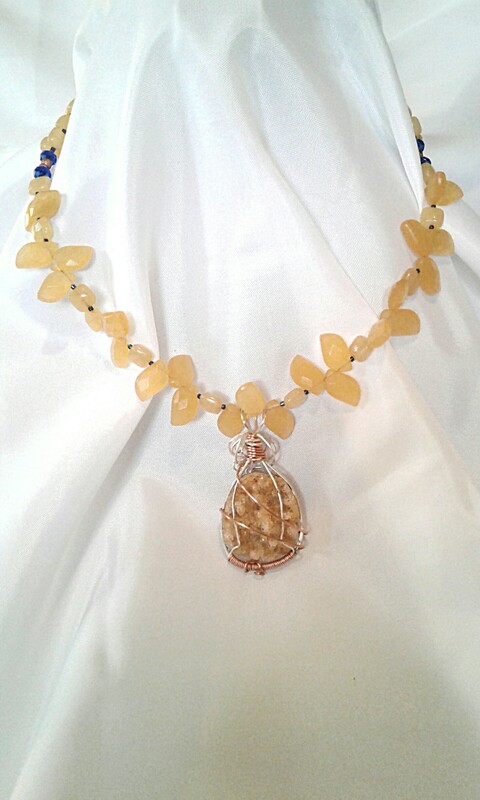 Perhaps that’s what has me thinking of something that captures the season’s warm, golden bounty, with a mix of Citrine, Aragonite, and Honey Calcite. 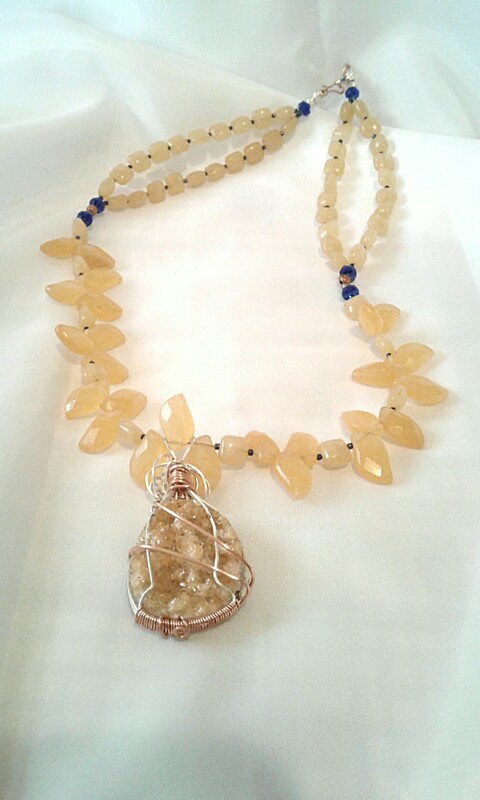 Citrine is used for drawing joy, wealth and abundance. Because it is tenaciously positive, it can be used to cleanse other stones. Citrine is also the stone most related to manifesting abundance and to the balanced use of will. Meanwhile, Aragonite has a calming and stabilizing effect, especially on emotions such as anger and stress. It encourages patience and appreciation of what you have. Golden calcite helps to integrate new energies and beliefs- most usually areas related to personal empowerment, such as relationships and business. Mixed with the energies of the other stones here it makes for an almost Fool-proof recipe for happiness. One of the more elaborate pieces I’ve made, I fell in love with the Honey Calcite pillow squares and Golden Aragonite leaf drops, knowing full well that yellow, in any shade but brightest lemon, is definitely not my color, no matter how opulent it is. I strung them anyway, using my favorite shade of Peacock Blue in delicas, as spacers, as well as fire polished Czech rondelles in a lovely shade of Cobalt, to pop the bridge where the necklace breaks into double strands, and draw the eye to it. The Citrine drusie cab is sparkly and bossy, measuring approximately 1 1/2 X 1″, unset: Presented au natural on the matrix it grew in and wired in 22 gauge silver plated copper, with 24 gauge copper wraps to protect the crystals against the impacts of life. 19″ long, and finished with a copper hook and eye clasp. With all it’s warmth and optimism, Number 19 is the perfect channel for it’s namesake, the Sun Card, with the keywords being Success, Abundance, and Prosperity.